Oh well, I needed it in a BAD way. I am hope alone with the kiddo and DH is out with the friends. I am a little bitter b/c I have NO ONE to go out with, all my friends stay in. 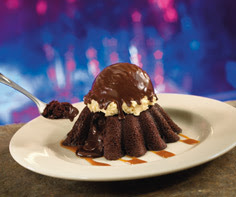 So, I am here alone with a MOLTEN. Oh, did I forget a HUGE glass of FF milk? Wow, I am in HEAVEN! I will let you all know how I am feeling tomorrow. I know this is the best thing for me and DS. I plan on raising DS on soy milk and very limited wheat. So, if I want him to do it, I have to do it too. Well, I am off to watch football and grade papers.